What Is Non-Radiographic Axial Spondyloarthritis? What Is Non-Radiographic Axial Spondyloarthritis? Non-Radiographic Axial Spondyloarthritis: What Is It, and How Is It Treated? When you think of inflammatory arthritis like rheumatoid arthritis, you often think of it affecting the small joints like the hands and feet. Non-radiographic axial spondyloarthritis (nr-AxSpA) is a different kind of inflammatory arthritis. It falls under an umbrella category of diseases called spondyloarthritis, which includes different types of arthritis with one distinguishing feature: There’s almost always inflammation in the spine. Back pain is “the hallmark of non-radiographic axial spondyloarthritis, which sets it apart from any other type of inflammatory arthritis,” says Fardina Malik, MD, a rheumatologist with NYU Langone’s Psoriatic Arthritis Center. 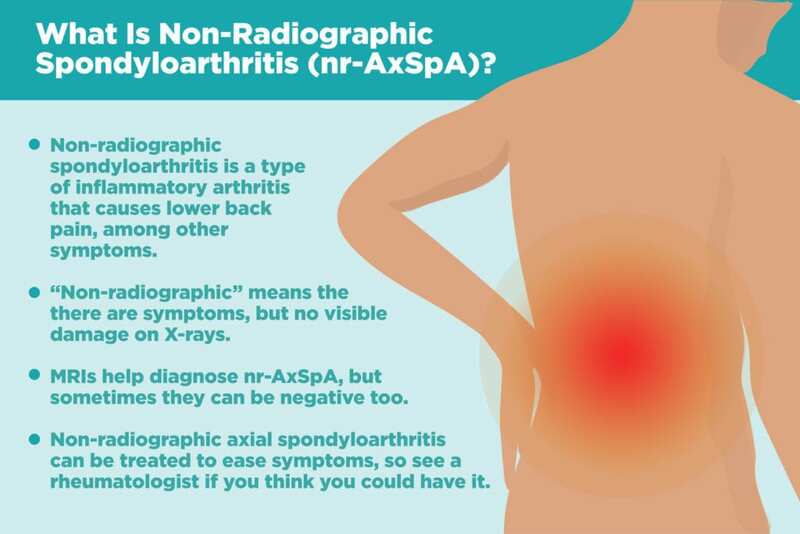 “Non-radiographic” means the disease causes symptoms, but there’s no visible damage on X-rays, the way there is with a related type of inflammatory arthritis called ankylosing spondylitis (more on that below). “Axial” refers to joints that the disease primarily affects: the spine, chest, and hip bone. “Spondyloarthritis” is a family of inflammatory arthritis that affects the joints and entheses, which are tissues between the bone and ligament or tendons. Back pain in non-radiographic axial spondyloarthritis can wake you up in the middle of the night and hurt in the morning. You may feel morning stiffness that makes it hard to get out of bed and get moving. Mechanical back pain, such from a strain or slipped disc, tends to feel better when you’re resting or not exerting yourself. Inflammatory back pain from nr-AxSpA, on the other hand, often feels better when you move around, exercise, or stretch. Non-radiographic axial spondyloarthritis symptoms often first strike in late adolescence or early adulthood, often before the age of 40. Enthesitis — inflammation at the entheses, where bone attaches to a tendon or ligament — is another factor that sets spondyloarthritis like nr-AxSpA apart from other types of arthritis. As the disease progresses from nr-AxSpA to later ankylosing spondylitis stages, enthesitis can cause the spinal bones to fuse together and make patients lose mobility. Because the pain comes from inflammation from the immune problems, rather than mechanical wear and tear on the joints, other body parts can hurt, too, especially the knees and heels. Inflammation from non-radiographic axial spondyloarthritis can also cause other symptoms that go beyond the joints. Psoriatic arthritis and enteropathic (inflammatory bowel disease-related) arthritis fall under the spondyloarthritis umbrella and tend to overlap with nr-AxSpA, so related symptoms like psoriasis plaques and gastrointestinal upset (such as diarrhea) are also common in non-radiographic axial spondyloarthritis. About 15 percent of nr-AxSpA patients experience uveitis: eye inflammation that can cause redness, pain, and blurred vision. (Learn more about uveitis symptoms here.) Other patients might experience “sausage digits” when the fingers or toes swell up from inflammation. Axial spondyloarthritis tends to take a long time to be diagnosed — an average of seven years between first symptoms and diagnosis, according to research presented at the 2018 American College of Rheumatology/Association of Rheumatology Health Professionals Annual Meeting. It can take years for inflammation to do visible damage, which makes it hard for doctors to pinpoint the cause. Rather than being due to mechanical problems in your back, non-radiographic axial spondyloarthritis occurs because of chronic inflammation. Nr-AxSpA is a cross between an auto-inflammatory and autoimmune condition. The immune system gets confused and thinks the body is being attacked. As the body produces inflammation to protect against the non-existent attacker, healthy tissue is damaged in the process. Doctors aren’t sure exactly what causes the immune system to act up in people with non-radiographic axial spondyloarthritis, though there seems to be a genetic component. For example, the gene variant HLA-B27 is common in people with spondyloarthritis. Research may turn up other genes that are involved as well. Non-radiographic axial spondyloarthritis is generally thought of as an early stage of ankylosing spondylitis (AS), another type of spondyloarthritis. The main difference between the two is that AS involves bone damage that can be seen on X-rays, but nr-AxSpA does not, because the disease hasn’t progressed far enough yet. Spondyloarthritis starts in the joints before affecting the bones, but X-rays can’t capture that early damage, says rheumatologist Hillary Norton, MD, medical director of Santa Fe Rheumatology. Instead, rheumatologists often use MRIs to spot swelling in the softer tissue. Still, MRIs aren’t perfect either. Some patients will show swelling that isn’t related to AxSpA; others have no swelling but do seem to have the disease. In the latter case, patients are monitored and sometimes take another MRI at a later date, says Dr. Norton. Research shows that it could take more than a year for MRIs to show visible swelling, so doctors look at the rest of the clinical picture, including symptoms, history, and HLA-B27 gene presence, before deciding on treatment. As the damage progresses, spondyloarthritis can move along the spectrum from non-radiographic to radiographic — though it might never progress there at all. Over two to 10 years, about 10 to 40 percent of patients with non-radiographic axial spondyloarthritis will develop ankylosing spondylitis, according to a study published in Expert Review of Clinical Immunology. Symptoms don’t change much from late-stage nr-AxSpA to early-stage ankylosing spondylitis, though as AS gets worse, the backbones could fuse together and make patients lose spine mobility, says Dr. Malik. There’s no single definitive test that can clinch a non-radiographic axial spondyloarthritis diagnosis, so rheumatologists look at a combination of clinical symptoms, blood tests, and imaging. Doctors might order blood tests that measure inflammation in the body, such as C-reactive protein (CRP) or erythrocyte sedimentation rate (ESR). Those tests can’t pinpoint where in the body the inflammation is occurring, though, so rheumatologists need to take the results in context of the whole clinical picture. They should also do a blood test for the HLA-B27 gene, which is found in about 83 percent of people with axial spondyloarthritis, according to a BMJ study. But again, this test alone can’t confirm a diagnosis, because about 98 percent of people who carry the gene will never develop spondyloarthritis. And the HLA-B27 gene is less prevalent in certain groups of people with axial spondyloarthritis, such as African Americans. In most cases, doctors will also use an MRI to help confirm a diagnosis of non-radiographic axial spondyloarthritis because MRIs can catch inflammation of the sacroiliac joint of the pelvis before the disease progresses enough to see bone fusion in an X-ray. But you can still have non-radiographic axial spondyloarthritis even if the MRI isn’t positive — and doctors may start treatment. “If a physician’s clinical suspicion is very high, given symptoms and other clinical characteristics — for example, the patient meets the Assessment of SpondyloArthritis International Society clinical criteria or simply does not have an alternative explanation for symptoms — we do offer trial of NSAIDs, physical therapy, etc.,” says Dr. Malik. At this point, treatment for nr-AxSpA is focused on addressing pain rather than stopping disease progression. Nonsteroidal anti-inflammatory drugs (NSAIDs) and physical therapy are generally effective. If those don’t work, the American College of Rheumatology recommends using tumor necrosis factor (TNF) inhibitors, which are biologic drugs that target specific inflammatory molecules. The FDA hasn’t approved TNF inhibitors or other biologics for nr-AxSpA yet, but promising evidence suggests that the drugs could slow the progression of nr-AxSpA if treatment starts early enough. Other kinds of biologics may help as well, though those haven’t been FDA-approved for nr-AxSpA yet either. Some biologic drugs are approved for treating ankylosing spondylitis, but because they haven’t been approved yet for non-radiographic axial spondyloarthritis, it can be tricky to get insurance companies to cover the treatment, says Dr. Malik. But there is a potential loophole. 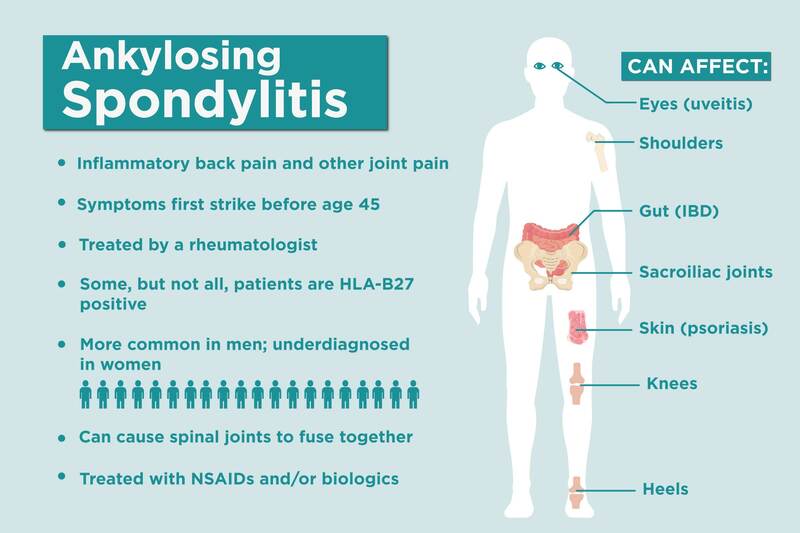 Other types of arthritis under the spondyloarthritis umbrella, like psoriatic arthritis and enteropathic (inflammatory bowel disease-related) arthritis, can be treated with biologics, so doctors can use those comorbid diseases as leverage when asking insurance companies to cover it. 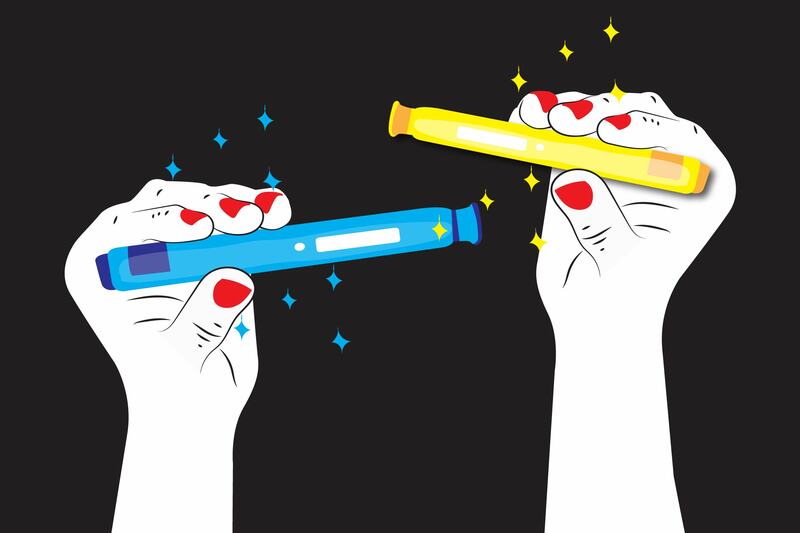 But with time, more FDA-approved treatments are likely to become available. “Patients should be hopeful and excited about the changes that are to come, including treatments,” says Dr. Norton. Radiofrequency Ablation for Arthritis: Could It Help Your Pain?